In todays 15-seconds of fame celebrity sweepstakes, an entertainer with staying power is a rarity. And one who is at the top of his game, after almost two decades in the business, is rarer still. George Strait not only has staying power, and is not only at the top of his game, but nearly 20 years after galloping onto the charts carrying the banner of traditional country music, he is still riding high in the saddle, and thrilling his legions of fans. Much like his oft-named influence Frank Sinatra, Strait has done it all his way. 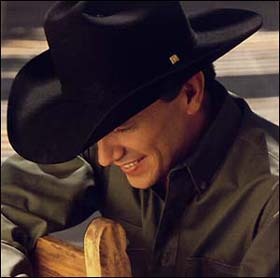 In 1981, Straits first single, "Unwound" landed the humble Texas cowboy on the country charts, precipitated a genre-wide return to country roots, and kicked off a remarkable recording history that has seen the release of 24 studio albums, all of which have been certified platinum or multi-platinum. In 1992, he starred in Pure Country, a film that perfectly captured the singers undeniable charisma and sparked a career surge that has never abated. In 1995, he released the phenomenally successful Strait Out of The Box, a monumental collection of 72 cuts, ranging from 31 #1 singles to obscure representations of his early days as a struggling singer. In the late 90s, he began The George Strait Country Music Festival, a multi-act, multi-media, multi-city grand tour of stadiums that has been dubbed "Countrypalooza" in the national media. Since its inception, it has been one of the highest-grossing tours on box office charts, always ranking in year-end Top Tens. Today, standing on the threshold of a new century, Strait is armed with a brand new album and ready to embark on The George Strait Country Music Festival Tour 2000. Latest Greatest Straitest Hits is his 26th album for MCA and his 4th collection of hits, which gathers the cream of the crop from four recent studio albums: Lead On (1994), Blue Clear Sky (1996), Carrying Your Love With Me (1997) and One Step At A Time (1998). The latter three were all Album of the Year award winners from the CMA, ACM and or TNN. Latest Greatest Straitest Hits also gives fans a bonus, two brand new songs recorded for this album, "The Best Day" and "Murder on Music Row, " a duet with fellow-traditionalist Alan Jackson. Its only natural that Strait would pay homage to his roots. A native of Pearsall, Texas, he grew up helping his school-teacher father on the family ranch. While in the Army, he began playing country music to pass the time, and when he returned home in the early 1970s, he put together the Ace in the Hole Band. They became extremely popular in the cavernous dance halls of the southwest, with a blend of new material, classic country and Texas swing. After several ill-fated attempts to make a mark on Music Row, MCA executive Erv Woolsey (who later became Straits manager) convinced MCA to sign the soft-spoken Texas rancher, and "Unwound" became a top-10 hit, an unheard of accomplishment for a brand new artist. But in the Urban Cowboy era of packaged country-pop music, country fans knew the real thing when they heard it and they embraced Strait like a savior. He was named Billboards Top New Male Artist of the Year and he would ultimately become the Top Male Artist of the Decade. By the end of the 80s, a new generation of "hat acts were pointing to George Strait as their biggest influence. How is it that George Strait can continue to scale such heights of success after 20 years? The key is that he cares about, and takes care of, the most important thing, the music. Other stars may go in for explosive pyrotechnics, wild stage antics and high-profile marketing and media campaigns, but George Strait just picks great songs and makes them his own. Then he takes those songs on the road for people to hear up close and in person, backed by the best live band in country music. Great songs delivered with integrity and sincerity. Its that simple. Another key to his success is the consistency he has maintained in his studio team. Tony Brown has produced all of Straits albums since Pure Country in 1992, and since then, he and Strait have kept the same basic cast of first-call Nashville studio pros from album to album: Eddie Bayers on drums, Glenn Worf on bass, Steve Nathan on piano and organ, Stuart Duncan on fiddle, Paul Franklin on steel guitar, Steve Gibson and Brent Mason on guitars, and Curtis Young and Liana Manis on background vocals. Likewise, Strait has forged lasting relationships with songwriters who have faithfully delivered top-flight material. Some of these longtime songwriting friends whose songs appear on this collection, such as Aaron Barker and Dean Dillon, have been writing for Strait since the 80s. Yet Strait continues to take chances with newer writers all the time, so that during the 90s names like Jim Lauderdale and Jeff Stevens have become intrinsically linked to Straits amazing hit parade. This combination of experience and freshness has resulted in a signature sound that remains solidly rooted in countrys traditions while delighting fans with the exciting and unexpected. Three tracks on this collection are from Lead On, the fast and frisky Cajun-flavored dance number "Adalida"; the tender ballad "Lead On"; and the heart-wrenching true-to-life "You Cant Make A Heart Love Somebody." Four songs from Blue Clear Sky also showcase Straits versatility. The title track captures the bracing rush of new love with its pulsing beat and Straits soaring chorus vocals. On "Carried Away" Strait gets the type of robust melody that truly allows him to show off his vocal prowess. "I Can Still Make Cheyenne" is a quiet, subdued story in the classic country mold about a rodeo star who loses his romantic love to his peripatetic lifestyle. "King of the Mountain" offers a honky-tonk lyric in classic style, with the kicker chorus "I thought I was king of the mountain, but I was only a fool on the hill." Carrying Your Love With Me contributes four hits to this treasure chest. On "Round About Way" Strait digs with relish into a clever, uptempo honky-tonk number. On the gently swaying "One Night At A Time" he plays the confident romantic lead to the hilt. "Carrying Your Love With Me" could be a page torn out of Straits own letters to his wife Norma and son George Jr., back home on the ranch. Conversely in, "Today My World Slipped Away" Strait delivers a powerful and sensitive remake of Vern Gosdins classic heartbreaker about the devastation of divorce. The two cuts offered from One Step At A Time prove that Strait continues to explore new avenues in his sound. The soaring, surging "True" marries the best of contemporary country guitar and rhythms with pure country fiddle and steel. On "We Really Shouldnt Be Doing This," Strait takes a classic rock and roll rhythm, tosses in some sly Elvis-like vocal licks, and still keeps the whole production country. The opening tracks on this album show that Strait remains a master interpreter of lyrics, a great finder of songs and a standard bearer for classic country music. "The Best Day" must be a song dear to the singers own heart; the touching and uplifting tale of the deepening relationship between father and son is not the first time he has paid tribute to the subject. "Murder on Music Row" is a reminder that George Strait cares deeply about country music traditions. On this tongue-in-cheek lament about the death of real country music, he and superstar partner Alan Jackson play off each other beautifully, tossing in impassioned vocal licks that would make Haggard and Jones proud.